You can use our L.R. 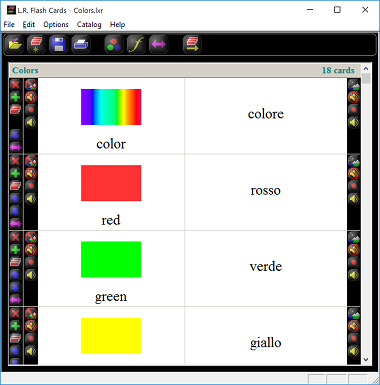 Flash Cards Windows software to make your own educational flash cards with text, images and audio. You create new card sets using the Flash Card Creator, then learn them by repetitive rote using the Leitner system and self testing. You can print your cards, create MP3 files if you have added audio, and save sets to your the catalog allowing you to build a personal library and create a new set of random selections of cards from the library. Download.com user review: I highly recommend this application to students, parents, and techers. Easy and fun to use. Such a great tool especially during exams. Download.com user review: easy, fast, effective. can change background color, can change font size and style. 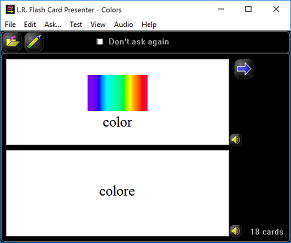 can add and drag pictures, can add audio, can record in the program for each card, automatically adds a new card while you are making flashcards, swap columns. 18 Apr 2017 1.7.4 Better integrate the Catalog review set and the source set when editing and setting of "Don't Ask"